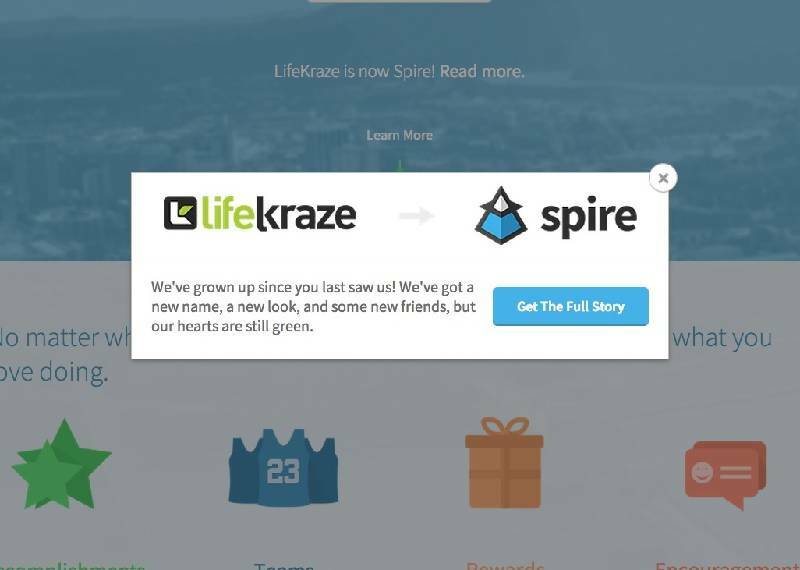 LifeKraze, the Chattanooga social media company based around healthy lifestyles that launched in 2011, is set to slim down its business model and change its name to Spire. The business will shift from a general interest social platform to something more akin to an incentives-based wellness program that sells services to employers, though the company will continue to serve its tens of thousands of existing customers, officials said. The new focus marks a big change for the startup, which originally aimed to join Facebook and Twitter as the social service that measures and rewards physical activity, but did not reach the 1 million users it needed to become cash-flow positive on its initial $1.25 million investment. Today's shift, along with additional private equity financing, will fundamentally change the business from a model like Facebook or Twitter to more of a subscription-based service with a per-employee fee paid by many of the 5,000 hospitals in the U.S., said Jay Kelley, president and CEO of LifeKraze, and now Spire. "Employees in the health care field have significantly elevated rates of conditions like obesity, depression, anxiety, asthma, type-2 diabetes, it's well above the national average for employees," Kelley said. "The hospitals that employ them are spending, on average, about 68 percent of potential profits on the health care of their own employees." The best way to fix that, Kelley said, is to offer LifeKraze's already-established social user base to clients as a way to help encourage and mentor their employees. Studies show that social encouragement is one of the best ways to persuade workers to take better care of their health, and Spire will combine its services with existing wellness initiatives to create a custom offering for each client. The new platform, which the company will announce today, offers hospitals like Erlanger -- which is participating in a pilot program along with Vanderbilt and others that will be announced later -- a dashboard to offer incentives to their workers to become healthier, and keep track of their progress as they go. New iPhone and Android apps will refresh the user experience, giving existing users a reason to stick around and luring clients' employees to sign up. Richard Miller, chief of the the Vanderbilt Trauma Division, where one of Spire's pilots is taking place, said the program was unlike any he had ever seen. "My staff is busy and under constant pressure, which makes finding a wellness partner both more important and more difficult," he said. "Fortunately, Spire makes use of our natural social dynamics to support and encourage a culture of health, how and when we need it." Combined with wireless devices like pedometers that communicate directly with the site, as well as regular health check-ups, hospitals like Vanderbilt will be able to play a larger role in encouraging healthy behavior than they have in the past, Kelley said. "We'll allow employers to see relevant stats of their employees' engagement in the wellness program," he said. Employers will also be able to offer their own rewards for health goals, and we have premium features that are in development." Users will still retain some privacy, including the ability to make posts completely private, but employers will still be able to tell whether an employee is participating or not, said Kelley. "One concern for employers is that if there is a shielding of that information, it would lose the potential value for them," he said. "We're working to coordinate that on an individual basis." While the data is valuable, it pales in comparison to the value of healthier employees, lower insurance premiums and out-of-pocket health care costs, said Jonathan Yagel, LifeKraze's co-founder and now vice president of business development at Spire. That's a benefit so tangible that it could one day be of interest to clients outside the health care field, he said. "The fact that you get the encouragement, the fact that people are cheering you on is the benefit," he said. "The data is there you can validate that the experience is happening." Though the company is rolling out its new service today, it will continue its pilot program through the first quarter of 2014, during which time it will continue to finalize its feature set, he said. The special offers and rewards from retailers across the country will remain in place for both new and existing members, and anyone who wants to sign up for the service will continue to be able to do so, he said. "These changes don't take away from what this community has been," he said. "If anything, it adds to it."